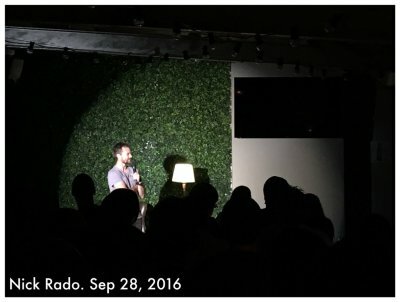 Wednesday 28th Sept was the first show at the brand new Rooftop bar at The Zookeeper’s Son Bar in Royal Oak promoted by Laugh Club. A nice upstairs room with a retractable roof (which was very handy on a wet night). It is a long narrow room which does make the view a little difficult from the back half of the room. Maybe a higher stage would help for future shows (or taller host). Multiple Best MC Award winning Nick Rado was our host for the night showing the form in his opening set that won him his awards. The first act was Paul Douglas. Paul was on great form with howls of laughter from the near sell out crowd. Next up was Ashton Brown, a good comic but some of the crowd didn’t seem to engage with him though he did get laughs along the way. After the break Nick pulled out his “Nigel Owens” routine which had the crowd roaring with laughter. Then up was headliner “7 Days” host Jeremy Corbett. He started off with the old comic bit of describing the room before moving into some pretty good material. Jeremy showed he hasn’t lost his stand up skills while sitting behind a desk on TV. Very good material well delivered. The crowd certainly loved him. A short close from Nick ended the night. The venue is nice with a very good food selection and will be neat in summer with the roof open. Laugh Club always produce quality shows at venues all over the greater Auckland area. I look forward to more shows here in future and other Laugh Club venues.